The weather is warming up indicate that spring had come. The nature start to turn green leaving all those white scene full of snow. Keep your coat and start to enjoy the scene outdoor. There are so many activities that you can explore and one of them is mountain biking. This kind of activity can put you into shape after storing-up fat during winter staying without much movement and sweating. It may not immediate but a few weeks of serious but fun riding will show some result. Mountain biking is adventurous but quite dangerous especially when you are racing down the side of the mountain. Ride with care and you can enjoy it . Basically there are three styles of mountain biking. It is terms as downhill, free riding and cross country. These different styles are similar in some ways but still they require different skills . You have to choose which style that you want so that you can choose the type of bike that suitable to it. Mountain biking can best be described as biking on an unpaved surface. Many areas throughout North America does have suitable locations designed for mountain biking. Check with the park concern to get the routes, regulations and any requirements that you need to abide before deciding to go down the trail. It is more fun if you can find any groups that have mountain bike rides and competitions. Take a look at any local media to see what is available in your area. There are groups for beginners and also those more advance riders. To become a great biker, you must achieve some acceptable level of endurance and stamina. Strong ambition and regular practice will make you succeed and conquer the course. Be patient as it takes time and lot of practices just like any other sports. 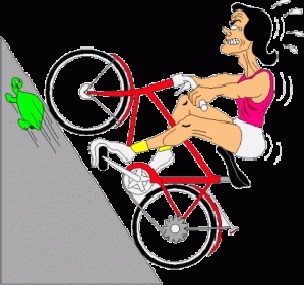 If you are beginner, you will have to get use to all those bumps and bruises from falling off the bike. What type of bike that you want is largely influenced by your personal liking and and the important factor is what type of riding that you will be doing. You may find it difficult and confusing to choose the right one as it come in all sort of styles, shapes and prices. Make a reference from the internet to help you in identifying which bikes is suitable for you. Make a price comparison too after you have found the right bike. Always try it first for few simple rounds before buying it and check its comfort, how its fits and how it is geared. Riding on unpaved roads can be very dangerous. For safety measures, wear a helmet, along with knee and elbow pads. If you are riding in the woods always wear goggles . Never take things for granted when you perform the mountain biking. If all the steps taken are adhered to, you will enjoy your mountain biking during this spring season.